‘Blackrobes’ was the name given to Catholic priests in the New World by the Native Americans, referring to their distinctive clothing. 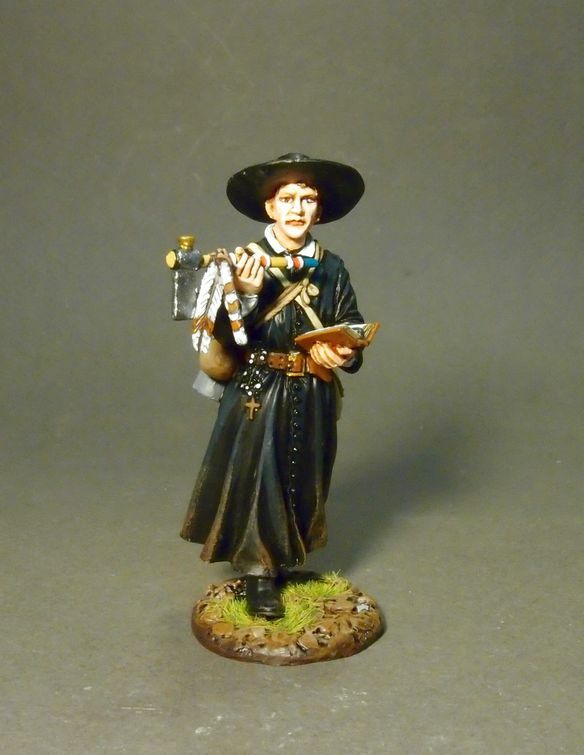 The Canadian movie “Black Robe” was the inspiration for this figure. For those interested in this figure, please check out the movie. The Society of Jesus is a Christian male religious congregation of the Catholic Church. The members are called Jesuits. With the discovery and colonization of New France during the 17th century, the Society of Jesus and the Jesuits played an active role in Canada. When Samuel de Champlain was placing the foundations of the French colony at Quebec, he realized that this land was inhabited by native tribes that possessed their own languages, customs and traditions. These natives that inhabited modern day Ontario, Quebec, and country around Lake Simcoe and Georgian Bay were the Montagnais, the Algonquins and the Huron. Champlain was a Christian man who felt that the soul was the only thing that mattered on Earth and that the souls of these Montagnais, Algonquin, and Huron must be saved. As a result, in 1614 Champlain invited the Recollects from France to spread the word of the true God, to convert the native inhabitants, and to save their souls from eternal damnation in New France. However, in 1624 the French Recollects realized that the magnitude of their task was too much to bear alone and that they would need more missionary bodies. The Recollects sent a delegate to France to invite the Society of Jesus to help them with their mission. The invitation was accepted and Jesuits, Jean de Brebeuf, Ennemond Masse and Charles Lalemant arrived in Quebec in 1625. Each Membership set also includes the following; The 2014 Collectors Club Annual, Product List, 2015 Calendar and The Adventures og Billy Bishop, a Graphic Novel by Alex Credidio.